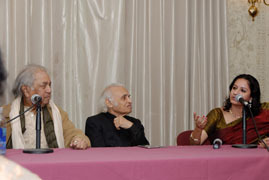 renowned Tabla artist par excellence. He is amongst the topmost tabla artists in India, and accompanies some of the very respected artists in the field of dance and music. He is an eminent member of the society, and his experience and expertise in his field are an unmatched contribution to the society. has been with the society since its inception. He is an engineer by profession. 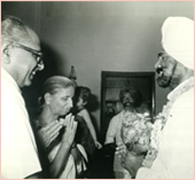 His interest in dance and music made him become an indispensible member of the society. He has been a pillar of support for the society. A businessman by profession with a keen interest in the field of art and culture. He has been with the society since its inception and has been contributing continuously in the growth of Kala Kunj. Art and culture sees no boundary of profession. Mr. Sharma has a flourishing business but his passion for art and culture made him join Kala Kunj since its inception. 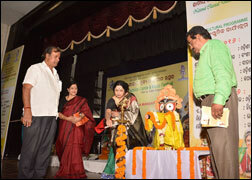 He has been supportive to the popularity and growth of the society. A lecturer of Sociology to civil services aspirants, Author of SOCIOLOGY DICTIONARY, Tata McGraw-Hill Publishing Company Limited, New Delhi 2009 and Chief Functionary of RAAHEIN DEVELOPMENT SOCIETY, an NGO committed to research, action and advocacy for, by and with the marginalized sections of society, Ms. Ranjana subberwal has been with the society, since its inception and is serving as . Rachana Yadav has done post graduation in Mass Communication from the Indian Institute Of Mass Communication, New Delhi. She has also completed her Prabhakar in Kathak from Prayag Sangeet Samiti , Allahabad university. Rachana has been a repertory member of The Drishtikon Dance Foundation- Aditi Mangaldas Dance Company. With them and as a solo performer she has performed in many important festivals & events , nationally as well as Internationally. One of the most respected members of the society. He retired as Additional Chief Administrative Officer (Ministry of Defence). 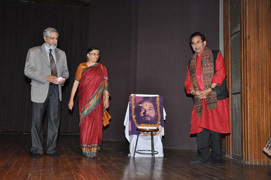 Always a patron of art and culture, he was with the society since its inception. 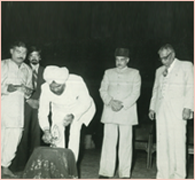 His continual support, vision and guidance has helped the society come a long way. A Kathak dancer, par excellence, Richa is an Empanelled Artist of the I.C.C.R and an A- Grade artist of Doordarshan. She has given numerable performances both on stage and television and holds a Master's degree in Commerce, Kathak and Hindustani classical vocal music. Radhika is a professional Management graduate with more than 10 years of experience in the corporate world, a professional Kathak performer and an ardent artist. 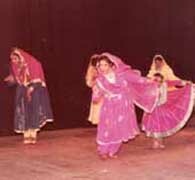 She began her formal education in Kathak dance from early childhood. She has done her graduation program in Kathak dance and is a graded artist from Doordarshan. 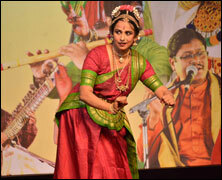 She has given various performances on stage and has also performed for programs produced and telecast on Doordarshan. 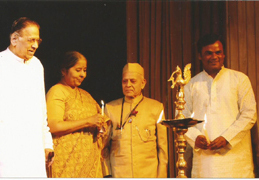 An A- Grade Artiste of Doordarshan and an Empanelled Artiste of the I.C.C.R, Nalini, started receiving her training in Kathak at the age of 10years and later had the good fortune of learning under the Great Master’s of the Jaipur Gharana, Pt. 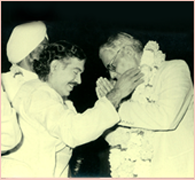 Sunder Prasad Ji and Guru Kundan Lal Gangani. While her training in Kathak carried on , she also had the priviledge to learn Odissi from Guru Hare Krishna Behra and the Legendary Guru , Guru Kelucharan Mahapatra. After Graduating in Political Science( Hons) from Lady Shriram College, Delhi University, she pursued her dance carrier and soon drew appreciation from Critics like Shanta Sarbajit Singh, Sh. V.V Prasad, Sh. Subramanium and her audiences. A performer par excellence, with inimitable grace, stage presence and technique, Nalini soon had her name added in the list of Best Kathak performers. She has also choreographed Ballets, Dance – Dramas for stage and Doordarshan and has also worked with physically challenged children. Currently she is working as a Dance consultant with the NIE Division, The Times of India and continues to pass her legacy of Kathak through to her students through Nritya Kunj. Served as Secretary of Kala Kunj, J.ext from 1980 till 2012 Born in an art loving family, Guru Ravi Jain , Professionally an Electrical Engineer , received his training in Kathak from the Stalwart Gurus like Pt. 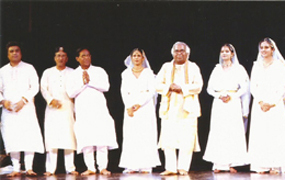 Shambhu Maharaj of Lucknow gharana , Smt Alaknanda Devi and Pt. Chaube Maharaj of Benaras Gharana . From an early age of eight years, he started performing on stage, and soon established himself as a performer and choreographer both for stage and television. Some of his productions are ‘Pratham Purush’, ‘Yashodhara’, ‘Jyoti Pushp’, ‘Shiv Bhakt-Kanappa’, ‘Varsha Mangal’, ‘Ab aeyo Khelan Hori’ etc. He also choreographed for various serials like ‘ Zindagi is pal zindagi us pal’ and telefilms and serials produced by eminent poet Sh. Ashok Chakradhar like ‘ Dhai Akhar’, ‘Bua Bhatiji’, ‘Gulabari’, ‘Baisakhi’, ‘Bitiya’ and many more. 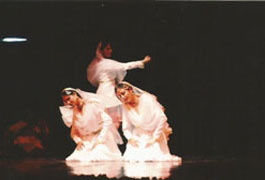 ‘Tum Chandan Hum Pani’, based on the life of Sant Ravi Das; where he played the role of Sant Ravidas is considered to be one of Doordarshan’s best Dance dramas and has been put on sale by Doordarshan Archives. 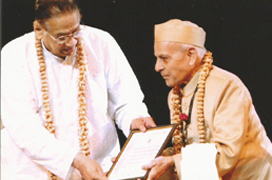 His contribution to the field of Music and Dance has been commendable and he believed in passing on the Knowledge of Dance and Music to the next generation and also providing a platform to young upcoming artistes through Kala Kunj, J Extension. A post-graduate in Hindi Literature, University of Delhi, She is well-versed in Bharatnatyam into which she was initiated at a tender age of 4, Kuchipudi and Kathak. She joined Doordarshan to discover the new vistas of creativity in the electronic art, and has undergone training courses in India and abroad in colour technology, on television. She has also produced over a thousand programmes in 23 years and gained appreciation from artists and media experts for her high artistic merit and aesthetic standards. She retired as the Director of the Central Production Centre of Delhi Doordarshan and is also accredited for restructuring the Archives branch of Doordarshan. At Doordarshan Archives too , her aim was to preserve the rich cultural heritage of India and pass it on to the future generation . This being the sole focus of her life , she has been associated with kala kunj for over two decades now and has tirelessly offered herself for this cause. 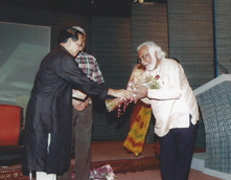 A well-known poet, filmmaker, painter and former Chief Producer of Doordarshan, Kuber Dutt's contribution to Doordarshan and Hindi Literature is incomparable. A deep thinker and fiercely independent in his thoughts , he conceptualized productions that made history. 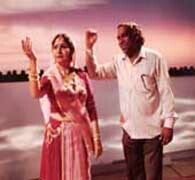 One such production was 'Janvani' , which gave a voice to the common man. He has many books to his credit as well. 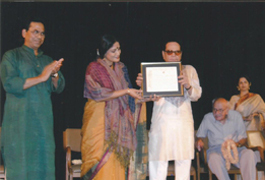 His association with Kala kunj, J. ext , as a Patron extended for over 2 decades and he was actively involved in all the stage productions and programmes that were organized by Kala kunj , over the years. Dr. Ashok Chakradhar is a well known name in the field of Hindi Literature. An Author , Script Writer, film maker , Poet and a Satirist par excellence, his contribution to the field of Hindi Literature has been commendable. An inspiration to many, Dr . Chakradhar’s knowledge is not only limited to Literature but he also has a deep understanding of Indian classical music and Dance. 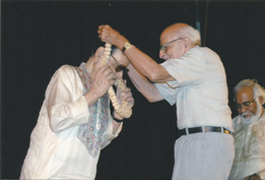 Dr. Chakradhar has been a patron of Kala Kunj, J. Ext , for many years now and Kala Kunj, J.Ext , thanks Dr. Ashok Chakradhar ,a dynamic personality and a wonderful human being for the support and guidance that he has always offered. 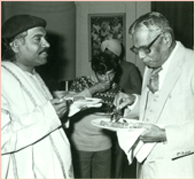 A pioneer of the Hindi literary movement known as Nayi Kahani , and a Hindi fiction writer, Sh. Rajendra Yadav is one of the most respected names in the field of Hindi Literature. Besides being a writer, Sh. 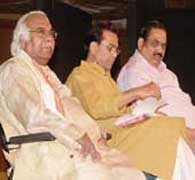 Rajendra Yadav was also a nominated board member of Prasar Bharti in 1999-2001. He has many famous novels to his credit. He is also the editor of the literary magazine HANS. He has been associated with Kala kunj as a Patron since its inception and has helped the organization grow culturally , aesthetically and intellectually.